The Community Senior Center of Richmond, Huntington, and Bolton is offering this Art Exercise Group led by Judy Bush. This is an opportunity for both experienced and inexperienced artists to explore and experiment, and also to get involved with extended projects. Program is open to adults of all ages. Activities will include drawing, painting, printmaking, collage, ceramics, papermaking, "muraling" and more. Cost of $8 per meeting, includes all materials, supplies and tools. Please email martha3@gmavt.net to register. Trying to make time for your creative side? Like to do your own thing, but just need a little support? Love a little company or friendly feedback? We have the answer! Bring your passion, art, and materials, and join us at Open Studio! We'll turn the lights on and give you space to do the creative thing you enjoy the most. Bring your own project and all your own supplies. Questions? Email us! Bring your little ones to get messy and create at Radiate. Our passion focuses on the process rather than the product. Each session toddlers and preschoolers will get a chance to play with materials, engage their senses, and experiment by moving freely between stations that spark their imagination. Feel free to come for some or all of the time. Suggested ages 18 months - 5 years old, with caregiver. Older siblings can join in the fun, although activities are geared toward toddlers + pre-schoolers. Come celebrate Spring! with a bright, light palette and lots of opportunity to celebrate spring colors and themes in this one-night class. We will paint on a long canvas, using lots of materials including stencils, paint, inks and other found objects. Open to all. No previous experience necessary. All supplies provided. Wear clothes which can get dirty. Come spend a Sunday afternoon at Radiate doing crafts while enjoying tea + cookies! Create beautiful marbled paper at this Craft-Tea Sunday. This is a simple process, with gorgeous results! You don't want to miss this one! Cost: $20 per person. All materials included. Registration is required. Register online here. Pay with credit card online or cash/check at the start of class. Come down to Radiate and paint a GREAT BIG EGG! The painted eggs will then be hidden all over the village for a week-long community-wide egg hunt! ALL AGES WELCOME! FREE Event! 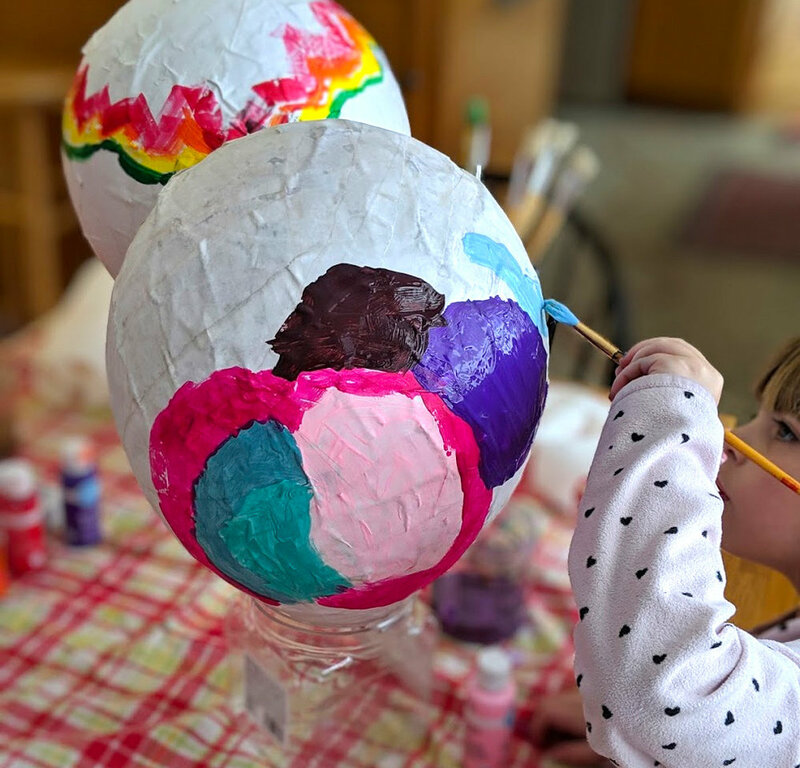 A GREAT BIG THANK YOU to the awesome kids & faculty at the Richmond Part 2 After School Program for making the GREAT BIG paper mache eggs! Radiate is excited to host this Stain Glass Workshop, guided by teaching artist, Natasha Bogar. This introduction to stained glass will use the Tiffany copper foil method of construction. Students will learn to cut, grind and fit glass shapes, apply copper foil, solder their piece together, and complete a unique piece of stained glass to take home. Teens are welcome. Pack a lunch for this full day workshop and learn all the steps to stained glass. All materials are included. Participants are asked to bring their own safety glasses, apron, and gloves. Make your art spring to life by learning stop motion animation! We'll create our own little worlds and then take it a step further to learn the basics of using a computer tablet to add movement to tell a simple story. As a non-profit and part of our mission, we strive to make art accessible for all. Please contact us for financial help, if needed. Students in the CESU district can ride bus from schools directly to Richmond Town Center, and we will meet them at the bus stop. If school is cancelled, Radiate is closed as well. Please register via email to reserve your spot and pay check or cash. Or please register and pay online below. Full payment due before the first class. Sometimes the hardest part of making art is knowing when you are "done". Come join Emily Mitchell at Radiate Art Space for a "finish it" Open Studio. Bring your past paintings from Emily's classes, or even some of your own work, to get some feedback and advice on how you might choose to finish your work. All supplies provided, and some new canvasses will be available for those who wish to start again! Plenty of 1:1 time with Emily and other art students to brainstorm, collaborate and celebrate! Back by popular demand, come give a stab at needle felting these adorable wool balls! Choose from a jingle ball, squeaky ball or solid wool ball and use a felting needle to create your own design. And don't forget, there's bottomless tea & cookies while you craft! Family Night Out! Clay & Cooking = Soup Bowls! Radiate Art Space and Richmond Community Kitchen are excited to be offering a unique night out! Parents cook and mingle, children create bowls at Radiate Art Space and then all come together to share a meal. Parents and children will be arriving at RCK at 4pm — the children will then head down to Radiate for an hour and a half of creating pottery bowls (one for them, one for their parent/guardian) which will be fired after the event. 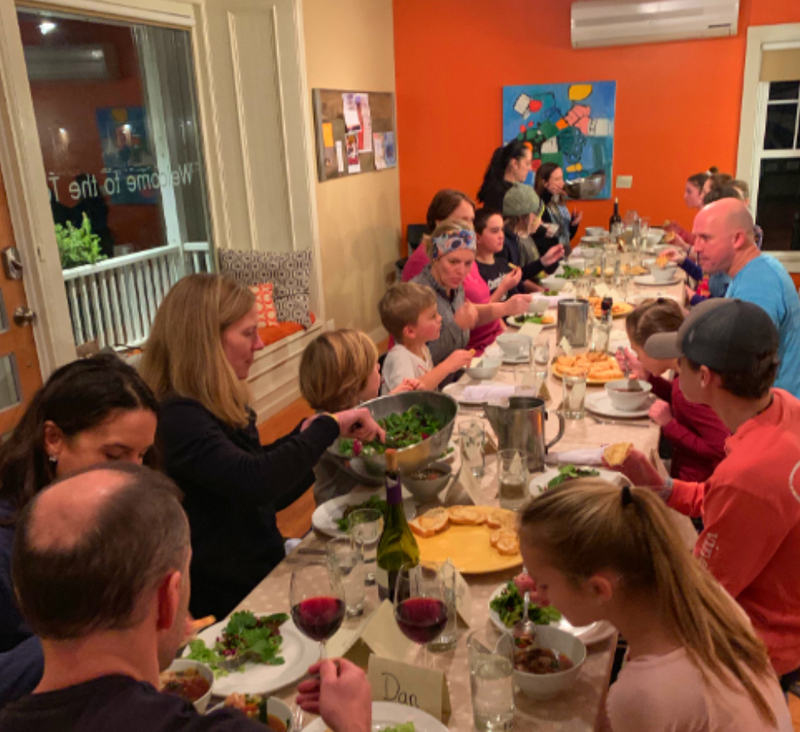 Parents will relax in the kitchen and create a community dinner of soup and bread (plus more!) together. When the kids return, we will all sit down and eat family-style! All dietary restrictions can be accommodated, please let us know during registration. Bowls can be picked up approximately 10 days after the event. Richmond Community Kitchen is BYOB - feel free to bring a beverage of your choice to class! This opportunity is partially funded by RISEVT. Sliding scale available upon request.